How to Avoid Apple TV Content Overload | Gary G. Abud, Jr. This entry was posted in BYOD EdTech Education Technology and tagged Apple TV BYOD Classroom Education Teaching Technology on January 12, 2015 by Gary G Abud Jr.
Apple TV is an amazing (and inexpensive) little device, used in many classrooms and homes, which lets you access content from a variety of web sources and display the mirror image of your iOS device (called “mirroring”) screen wirelessly using AirPlay to your display. But sometimes there can be too much content, and that can distract from the main goal. 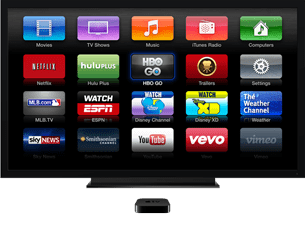 Are you using an Apple TV in your classroom to stream online multimedia content or mirror your classroom’s mobile devices? If so, chances are you already know how much great content is available using your Apple TV to stream right in your classroom. But did you know that you can control what content and apps appear on the main menu of your Apple TV when you turn it on? Regardless of whether you’re streaming content or mirroring your iPad to the screen, when the Apple TV starts up in a classroom you don’t know what content (from the iTunes Store) will appear. To help you have more control over what apps and content appear on your Apple TV, a couple of handy settings, including Restrictions, will allow you to limit the movies, TV shows, music, and apps that show up when your Apple TV is on in the classroom. That way, you can focus on the content you’re teaching and activities you want to with your students without having to worry about distractions or age-inappropriate content appearing.